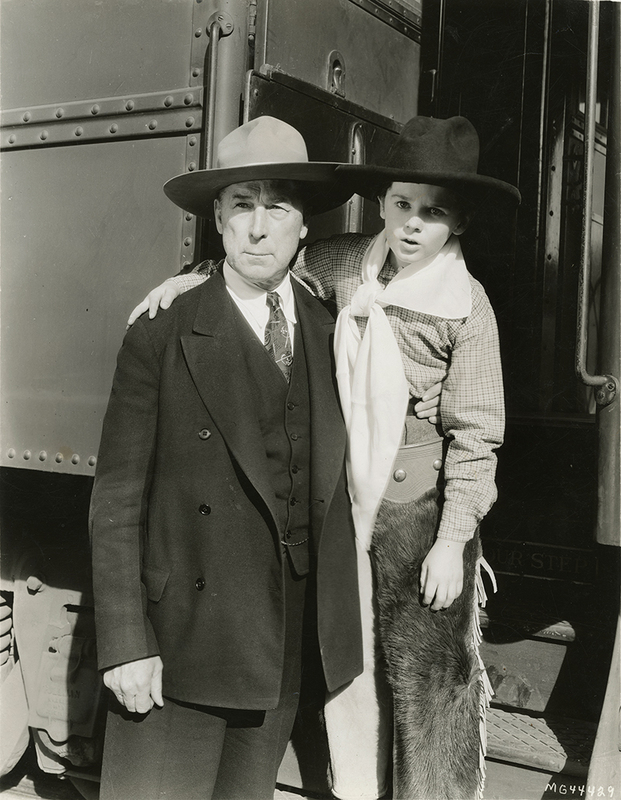 SCVHistory.com LW2927 | William S. Hart | Hart with Freddie Bartholomew, 1935. Newhall resident and silent film star William S. Hart poses with London-born child actor Freddie Bartholomew. Undated MGM publicity photo, 1935. He's a British Cowboy: Freddie Bartholomew, who rocketed to fame with his portrayal of the child hero of "David Copperfield," returns to Hollywood from New York wearing chaps and a five-gallon hat, determined to become a silent man of the great open spaces, and is met at the train by our own William S. Hart. Freddie will next be seen in Greta Garbo's "Anna Karenina." We don't know who composed the caption, and we don't know what is meant by "our own" William S. Hart. Hart wasn't under contract with MGM or anyone else in 1935. As for the date of the photograph, "David Copperfield" was released in January 1935, when Barthlomew was 10; "Anna Karenina" was released in August 1935, when he was 11. LW2927: 9600 dpi jpeg from original photograph purchased 2017 by Leon Worden.